As a default setting, Outlook never automatically downloads images from the internet. While this is a valid security measure, it means that you have to manually download them for each and every email message in your inbox that contains pictures. Here’s how to override this setting. 2. 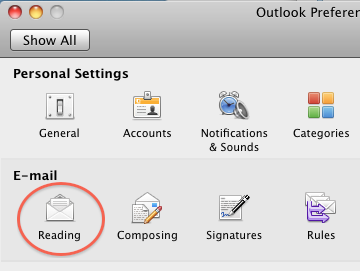 Go to the Menu at the top of the screen, click Outlook and select Preferences. 3. In the E-mail section, select Reading. 4. Go to the Security section and select either the In all messages radio button, or if you want a little more security, select the In messages from my contacts radio button. 5. Close the Reading window.